Shirts With Random Triangles: Scott Frost Named New Head Coach Of UCF. Scott Frost Named New Head Coach Of UCF. 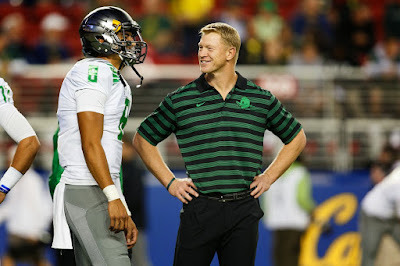 Marcus Mariota with Scott Frost. Image via The Daily Emerald. Scratch Central Florida off the list of schools without a head coach. Scott Frost, who was most recently offensive coordinator at Oregon, was named as UCF's new head coach Tuesday Morning. "UCF is an excellent opportunity for me because our student-athletes can succeed immediately, both competitively and academically," Frost said in a statement released by UCF. . "We've had great recent success -- I vividly remember watching the Fiesta Bowl victory. With our student-athletes, football staff, facilities, fans and supporters, I know we will bring exciting and winning football back to Orlando." Frost began his stint at Oregon as a wide receivers coach in 2009. He became the Ducks' offensive coordinator and quarterbacks coach in 2013. He is credited in developing former Oregon cutest Tennessee Titan QB Marcus Mariota, who won the Heisman Trophy in 2014. Frost replaces George O'Leary, who left UCF midway through what became an 0-12 season for the Knights.